My Two Favorite Inshore Fish To Eat! There is always something memorable about going out for a day of fishing and then coming back home and being able to eat your catch. My 2 favorite fish to eat are mangrove snapper and redfish. They are present in great I numbers in the New Smyrna Beach area. Bullbuster Ambassador Thomas Klosowski with a nice mangrove snapper. My favorite way to eat mangrove snapper is probably the most basic way to eat fish. 1) I scale and gut the fish as well as taking the head of the fish off. 2) The second step would be seasoning the fish with garlic powder, salt, and pepper. I like to slice fresh onions and put thyme inside body cavity. 3) I take some aluminum foil and create a foil packet for the fish. 4) Before I close the packet I put 2 tablespoons of olive oil and a few slices of butter and thinly sliced lemon. 5) After folding your foil packet up put it in your preheated grill or oven. I have only cooked this recipe on a grill. 6) I like to leave it on the grill for 15 minutes on medium high heat. You will know the fish is ready once you start smelling the delicious smell of the lemon and herbs combining with the butter and olive oil. 7) Once taking it off of the grill I like to wait at least 3-4 minutes for the juices to redistribute throughout the fish. I eat this dish with foil packet vegetables and wild rice. Bullbuster Ambassadors Chris Meza and Lalo Ojedas with a stringer of Texas Redfish. My favorite way to eat redfish is one of the most popular ways people eat it. It is called redfish on the half shell. This dish is a Cajun delicacy served in many parts of the deep south. Chef Paul Prudhomme is one of the many people responsible for the popularity of this dish. 1) Take your your redfish and fillet it. But you must be sure to leave the scales and skin on, you will understand why later on when it comes to the cooking process. 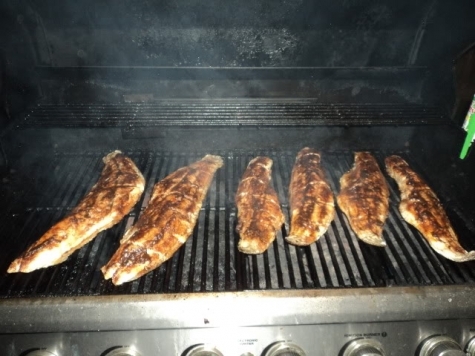 2) Once your have your redfish fillets, you want to season the redfish fillets with melted butter, salt pepper and the blackening seasoning of your liking. 3) Your grill should be on the lowest setting as possible for this cook. The idea for this recipe is low and slow. 4) While cooking the fish I occasional like to brush with a little bit of fresh squeezed lemon juice and melted butter mixture. The cook time on this recipe should be 30 minutes to an hour. Once you plate your fish the recommended side items to pair with this would be red beans and rice or a nice salad. This fish is succulent, tender and very flavorful. It might be a long wait but it is more than worth it.